Did you know that right now, there is a giant invisible funnel on the top of your practice that is capable of generating a steady stream of new patients?! As an expansion on last months blog, A Simple Tool for Mastery of Online Marketing, we will consider the total funnel, to include not only online marketing but also brand awareness marketing (logo, signage, etc. ), traditional marketing (television, radio and print advertising, etc.) and internal marketing (asking for referrals, thanking referrers, etc.). At the top of the dental marketing funnel sits potential patients who may not have an immediate need for dental services but lack the awareness and/or trust to seek out a specific company by name, if so be that time comes along. These potential patients tend to hold the highest cost per acquisition since you have to move them all the way from the top of the funnel to the bottom before they will convert from prospects to patients. Brand awareness tactics take on more of a push marketing strategy in order to get your practice’s name out to the community and help propel your positive reputation. This is a crucial step to building long-term brand equity and potential customer referrals; but, can require a consistent investment of time and money. 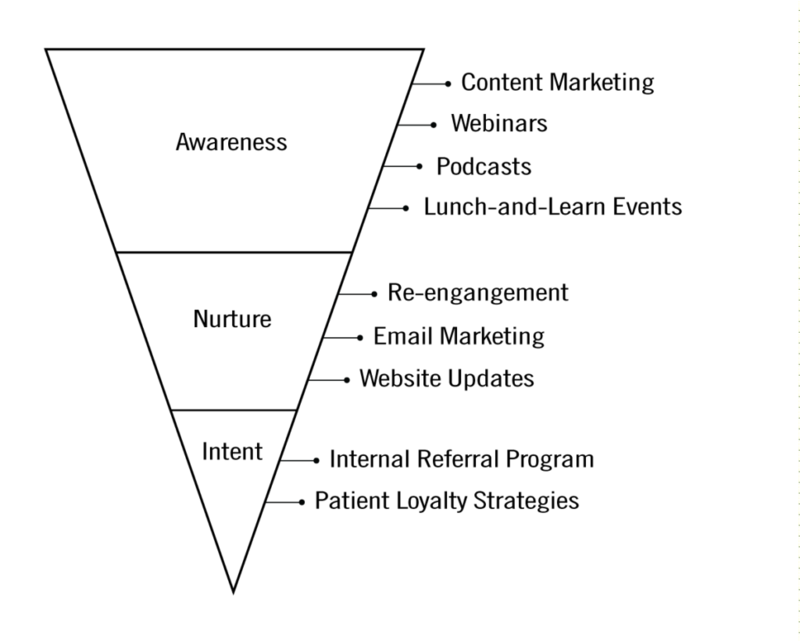 In the middle of the funnel are potential patients who may be curious about services but are still early on in the conversion cycle or have fallen dormant and require reengagement to get them in the door. These patients are most commonly mid-level cost per acquisition since you have already moved them down from the top of the funnel. They will require consistent nurture marketing tactics that will keep your practice top-of-mind and encourage them to return. Middle of the funnel marketing strategies include re-engagement email marketing, a website that is easily found through search engines or citation sites and optimized for key, local search phrases. Lead nurturing stands on the shoulders of awareness, so the more time you put into establishing a strong, trustworthy brand, the more weight (and less cost), a lead nurturing campaign will hold. The bottom of the funnel is the transition from push to pull marketing. These patients who are intentional about finding a dentist right now are in the bottom of the funnel. Intent or direct marketing tactics are best to squeeze them out of the funnel and right into the practice. These tactics act like a person working on your behalf to tap intentional patients on the shoulder and say, “Need a dentist? Come right this way…” and lead them right to your chair. Patients in this part of the funnel have the lowest cost per acquisition since they are ready to make a decision and have already gone through the branding and nurturing stages of the marketing funnel. Bottom of the funnel marketing tactics include an internal referral program, targeting local AdWords campaigns, and direct mailing offers. Many practices over-invest in awareness marketing, increasing brand awareness but struggle to convert their marketing efforts into qualified leads. Some practices skip nurture tactics altogether, not realizing that the patient needs further education or trust-building from the practice to convert from a “maybe” patient into a “yes” patient. Others rely too heavily on direct marketing, creating an upsurge in patients from time to time but ultimately lack the targeting and consistency needed to grow a practice. However, a great dental marketing funnel works best when all parts are worked simultaneously and consistently. To have a free assessment of your current marketing funnel, contact Big Buzz Marketing Inc.